In a bid to overtake a vehicle at Greater Kailash-I, a rich businessman's son collided his speeding Chevrolet car with a motorcycle of a delivery boy of Pizza Hut. The rider was killed on the spot and a guard was injured. For Amita Dutta, there is no other way to express her feelings and emotions than through her paintings. The Delhi High Court today came down heavily on a class X student, who had uploaded a morphed "obscene" picture of one of his female classmates on social networking site Facebook, as well as his parents. Mayor of Delhi Rajni Abbi today said union home minister P Chidambaram had invited a delegation of the Municipal Corporation of Delhi (MCD) to discuss the proposed trifurcation of the civic body. The crime branch has recovered a knife, allegedly used by Sumit Handa to murder his wife Niranjani Pillai, a South African national. Sources said the button and hook of the trousers worn by Niranjani at the time of her murder had also been seized. An inquiry has found that provisional certificates were issued to non-existent illegal colonies, say sources. In a bid to overtake a vehicle at Greater Kailash-I, a rich businessman's son collided his speeding Chevrolet car with a motorcycle of a delivery boy of Pizza Hut. The rider was killed on the spot and a guard was injured. The delivery boy has been identified as Sukhwinder (25) and the guard as Hoopinder, also in his twenties. Sukhwinder worked for the Pizza Hut outlet at M-Block market in GK-I. He lived with his family at Bilaspur Camp in Badarpur. Hoopinder was a residential guard of R-79, GK-I. He was an employee of Noble Securitias, a security firm. The accused, Prateek Tekwali, is a second year BCom student at Bhagat Singh College. His father, Yash Tekwali, is the owner of Prince Pan in the M-Block market of GK-I. Prateek lives in M-15, GK-I. Prateek was nabbed and beaten by public when he attempted to flee with his damaged car after the accident. Later, he was handed over to the police. The police said a case under Section 279 (rash driving or riding on a public way), Section 337 (causing hurt by act endangering life or personal safety of others) and Section 304A (causing death by negligence) of the Indian Penal Code has been registered against Prateek. "The incident occurred around 10 pm yesterday on the two-way road outside R-77 A in GK-I. Prateek was trying to overtake a vehicle from the opposite lane. He collided with the delivery boy, who was heading towards his store in the M-Block market. 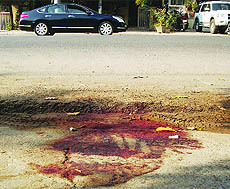 A residential guard was also injured," said a police official. Sukhwinder was rushed to the AIIMS Trauma Centre, where he was declared 'brought dead'. His postmortem was conducted at the same hospital. Hoopinder was also taken to the AIIMS Trauma Center with a fractured leg. The official added Prateek's medical examination disclosed that he was not under the influence of alcohol at the time of the accident. An eyewitness, Raj, however said that Prateek was in a drunken stupor. "He seemed drunk when public caught him while trying to escape. Prateek's car had halted because the radiator had busted. He was reeking of liquor," he said. Another eyewitness, who didn't want to be named, said he saw Sukhwinder plunge to his death. "When the car collided with the motorcycle, Sukhwinder flew five feet into the air and then fell down on the pavement. He was bleeding profusely and died on the spot. Sukhwinder's motorcycle skidded due to the impact of the accident and rammed against Hoopinder, who was standing in front of a Hyundai Accent car. A tyre of the Accent car was also damaged," said the eyewitness. Sanjay, the owner of Noble Securitias, said Hoopinder sustained multiple fractures on his leg. "He had a surgery at the AIIMS Trauma Centre, which happened from 2 pm to 7 pm. The doctors have told me to bring him again 15 days later. Hoopinder's family has been informed about the matter and it will arrive in two days," said Sanjay. For Amita Dutta, there is no other way to express her feelings and emotions than through her paintings. Born as hearing and visually impaired, Amita has always aspired to see herself at a place she has reached today through constant efforts and perseverance. Hailing from Gurgaon, Amita uses an unconventional but a natural medium, coffee, for her work of art. Her amazing paintings, done by using coffee, displayed just at the entrance of Haryana Pavilion which are being appreciated by one and all, has become a greater source of inspiration for her. "I chose this medium because of its unpredictable nature. Also, the consistency of the medium is changed by long and tedious process. 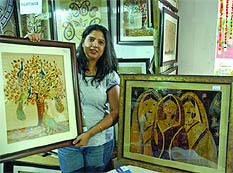 To produce such unique work of art, it requires a lot of professionalism, expertise and patience," said Amita, through a translator. Living up to the theme of the India International Trade Fair 2011, "Handicrafts -the magic of gifted hands", it is not only Amita's creations that is an example of gifted hands, but her whole life also sounds a combination of magic and gift. Amita's husband Charu Dutta is also challenged like her and has always been her inspiration in everything she peruses. Her husband and in-laws encouraged Amita to complete her schooling after which she joined New Delhi Women's Polytechnic. She completed three-year course in interior designing and joined her family business of furniture manufacturing and interior designing. She also learnt to use computer and American Sign Language from her husband. Though, after Amita became a proud mother of a nine-year-old daughter and a seven-year-old son and was independently taking care of their needs, it was not enough for her encouraging spirit. She did a course in art and craft to learn various forms of arts. Out of all the forms, it was coffee painting that took her fancy. She has put up her paintings at various festive fairs. And now she is capable enough of procuring corporate and individual orders for custom made designs. After Justice Hima Kohli reprimanded the student of a private school in Vasant Kunj area of south Delhi, who has been expelled from the school, his father too was pulled up by the court for failing to take necessary action. "What you (student) have done is an offence. It can not be taken lightly as it is a serious matter punishable with three years of jail," Justice Kohli warned the student. She also pulled up his father. "Why are you insisting on counselling by the school? What were you doing when the matter came to your notice," the judge said while rejecting his immediate plea to direct the school to re-admit the student. However, the court issued notice to the school authorities on the matter, seeking its reply by November 30. Meanwhile, the boy and his father apologised to the judge, and said this would not be repeated in future. The father even told the judge that he has already punished the boy, to which his son said he won't repeat it in future. After the school administration refused his father's request to allow his ward to attend classes, he had approached the high court seeking relief. His counsel Ashok Agarwal made "the best interest of child" the basis of his petition, pleading that restricting the student from attending classes would further spoil his future. "It is an established rule that the best interest of the child has to be kept in consideration. "Further, the school is obliged to follow the Delhi Education Rules which clearly states that in such cases where a child is in a situation of conflict with law, the schools must adopt a reformative approach towards such students rather than taking punishment measures like striking off the child's name," Agarwal contended. The petitioner submitted that when he went to the school as usual on October 18, he was not allowed to attend class and was told that he had been suspended. The student was given a suspension letter on October 20, he said. She said the delegation would comprise deputy mayor Anil Kumar Sharma, Leader of the House Subhash Arya, current and former chairmen of the standing committee Yogender Chandolia and Vijender Gupta, respectively. Abbi said she would request the home ministry to not come under the pressure of the state government and play with the interest of the citizens of the city. "The home ministry should not bow to the pressure tactics of Chief Minister Sheila Dikshit on the trifurcation of the MCD since the issue relates to the provision of civic services to 1.67 crore citizens of the city. The trifurcation will benefit only one person, the Chief Minister," she said. The knife was seized from Rai in Haryana, where Handa allegedly burnt Niranjani's body. Sources said the knife would be sent for forensic examination to ascertain whether it has Niranjani's blood. The sources added that the laptop cord used to strangulate Niranjani was also found. Niranjani's brother Lingesh Pillai and uncle Kishan arrived at Delhi on November 16 to assist the police in the investigation. They brought the hair and blood samples of Niranjani's parents, certified by the Oath Commissioner of Durban. The samples have been sent to the Forensic Science Laboratory (FSL) in Rohini.